Today is the 84th birthday of the zoologist Dian Fossey. She is the reason that we know more about gorillas than we used to and that we value them more than we used to. The world is a better place because Dian was in it, needs more people like Dian in it, and still feels the loss that she has left it. BEST KNOWN FOR: Zoologist Dian Fossey was one of the foremost primate researchers in the world who for 18 years studied of a group of gorillas in Rwanda. Primatologist and naturalist. Born on January 16, 1932, in San Francisco, California. Dian Fossey enriched our understanding of gorillas through her intense study of these animals from the 1960s to 1980s. She was interested in animals from childhood, but changed college courses from pre-veterinary studies to occupational therapy. Dian Fossey moved to Louisville, Kentucky, to be director of the Kosair Crippled Children’s Hospital occupational therapy department in 1955. But she soon became restless and dreamed of traveling to Africa. On her first trip to Africa in 1963, Fossey met palaeontologists Mary and Louis Leakey, who encouraged her dream to live and work with mountain gorillas. In 1966, Dian Fossey caught up with Louis Leakey at a lecture in Louisville, and he invited her to study the mountain gorillas in Africa. She accepted his offer and lived among the mountain gorillas in the Democratic Republic of Congo until civil war forced her to escape to Rwanda. Dian Fossey established the Karisoke Research Foundation in 1967, alternating her time between her fieldwork there and obtaining a Ph.D. based on her research at Cambridge University. She earned her degree in 1976 and later accepted a visiting associate professorship at Cornell University. In 1983, her book, Gorillas in the Mist, was published and became a best seller. A film with the same name was also released in 1988 starring Sigourney Weaver as Fossey. Considered the world’s leading authority on the physiology and behavior of mountain gorillas, Dian Fossey fought hard to protect these “gentle giants” from environmental and human hazards. She saw these animals as dignified, highly social creatures with individual personalities and strong family relationships. Her active conservationist stand to save these animals from game wardens, zoo poachers, and government officials who wanted to convert gorilla habitats to farmland caused her to fight for the gorillas not only via the media, but also by destroying poachers’ dogs and traps. On December 26, 1985, Fossey was found hacked to death, presumably by poachers, in her Rwandan forest camp. No assailant has ever been found or prosecuted in her murder. Dian Fossey strongly opposed tourism, as gorillas are very susceptible to diseases by humans like the flu for which they have no immunity. Dian Fossey reported several cases in which gorillas died because of diseases spread by tourists. She also viewed tourism as an interference into their natural wild behavior. 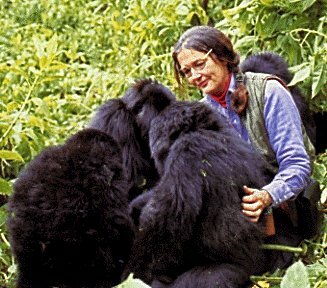 Fossey also criticized tourist programs, often paid for by international conservation organizations, for interfering with both her research and the peace of the mountain gorillas’ habitat. She was truly a gift and that’s what happens to those who try to change the world. They are murdered. We are truly a pathetic species. She did such wonderful work. She tried so hard to use the love she had for good but money is god and her life meant nothing to the greedy. Nothing changes. We just mourn the loss of those who are killed for the goodness in their hearts. I’m still horrified by what happened to her.